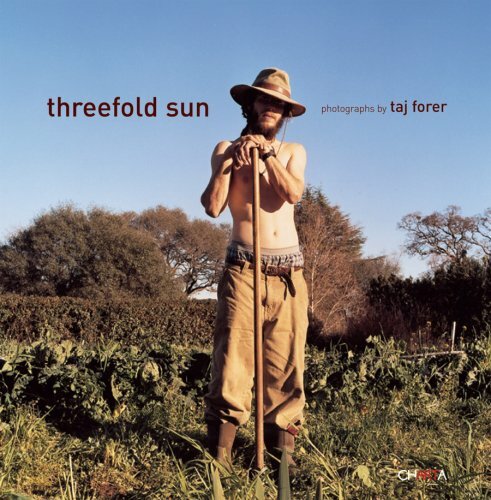 In Threefold Sun, photographer Taj Forer takes a warm and thoughtful look at some people and places influenced by the work of Rudolf Steiner (1861-1925), the German artist-philosopher who gave the world not just his work and writing, but Waldorf schools and biodynamic farming. Forer's color photographs of laundry lines, garden hoses, straw forts, rubber boots and kitchen tables are at once beautiful and banal. Beauty is where it might be expected (a wall of sunny children's paintings, a tree house), but more often where it wouldn't be (a slightly deflated yellow ball in a cement play yard, a sledding hill without enough snow). Utopia is waiting in a patch of sun, a smudge of mud, a chalkboard message professing heavenly joy, a little bit of blood in the small nostrils of a boy baptized with everyday dirt. Forer received his BA in Photography from Sarah Lawrence College in 2003, and is a 2007 Artist in Residence at the North Carolina Contemporary Art Museum; he is a co-founder of Daylight Magazine, an award-winning biannual publication of contemporary documentary photography.